Last year, I did an art exchange with some on-line friends. It was a lot of fun. 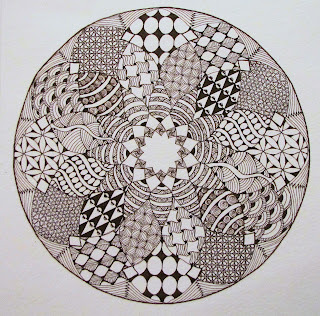 I was just getting into Zentangle and made tiles for each of the people that I sent stuff too. In return, they sent things that they made back to me. One sent a knittted hat and beautiful jewlery that she made, another sent the most adorable knitted cupcakes (which my 5 year old promptly claimed for himself.) Since I enjoyed it so much, I proposed to do it again this year. I had four takers interested in doing a "creative swap" with me. 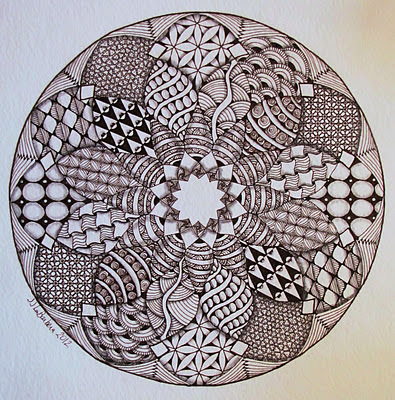 As I only had four takers, I figured that I could really have fun and make some larger zentangle inspired pieces. My skills are better than they were a year ago (I hope.) and I saw this as a chance to give back something beautiful to friends who had sent me such wonderful things. 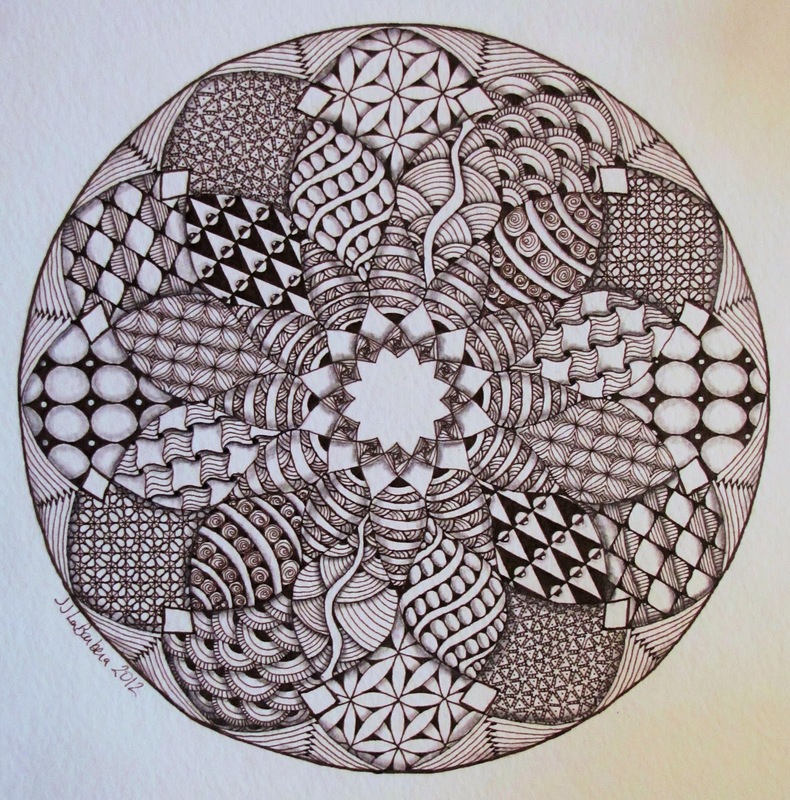 Mandalas and Zendalas have really been inspiring to me as of late. I created one for an auction at my son's school and wanted to keep going. Once again, I started with mandala design that I traced out on to watercolor paper. My geometry skills are at a solid F so I have to rely on a shape created by someone else. 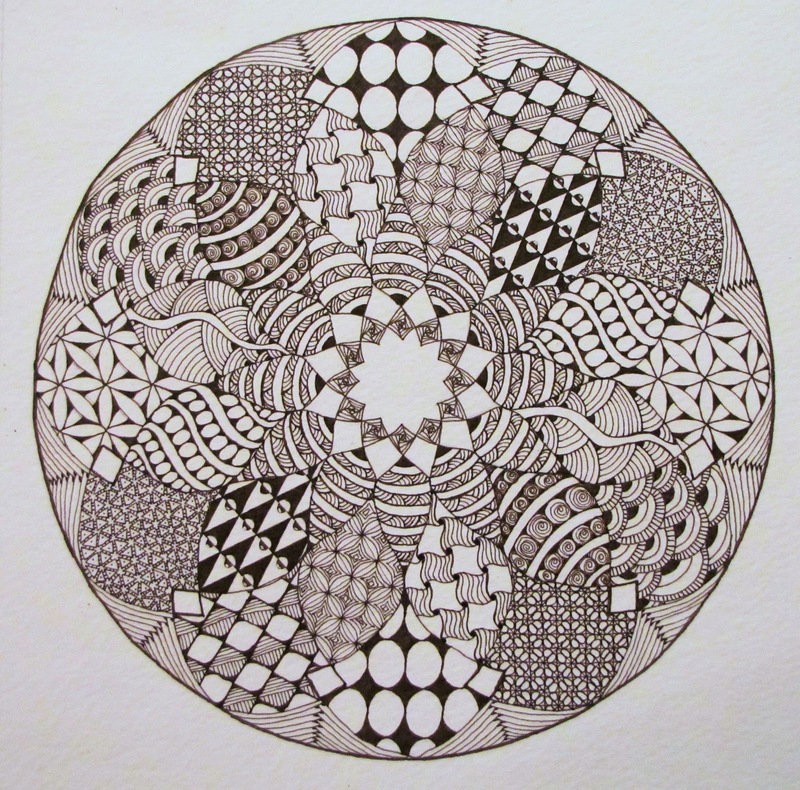 Wanting to keep with the Indian feel of the mandala, I chose to draw in sepia. I used the micron speia pens in a 01, 05 and 1 sizes. I did most of the drawing with the 01 and used the others for fill in and where I wanted a thicker line. Mostly done here. Just needs some shading and a few highlights. It took me about 3 weeks to get it all done. In that time though, there were days when I didn't work on it at all and other days that I drew most of the day. I finally got it all finished this morning and I am soo pleased with the finished product. I am tempted to keep it and hang it on my own wall. ﻿ As I was working, I was afraid that the many different patterns would make it too busy. Often I want to fill in each section with something different. Once I started shading though, the different sections started to pop out and pull back into their own spaces giving them enough seperation that I think it works. The final size is roughly 7" and will be framed in a 12X12 frame with a 8X8" opening. Your shading makes this zendala perfect! What an incredible detail!